Can the countries of the Caribbean Community and Common Market (CARICOM) take international legal action against the States that are warming the planet with devastating consequences not only for their survival, but in some cases even their existence? This question comes into sharp focus in the wake of the damaging effects of flooding and landslides in St Vincent and the Grenadines, St Lucia and Dominica as 2013 came to an end. The Prime Minister of St Vincent and the Grenadines, Dr Ralph Gonsalves, described the flooding and landslides as “unprecedented”. He gave a preliminary estimate of damage in his country alone to be in excess of US$60 million. People who live in the Caribbean know from their own experience that climate change is real. They know it from days and nights that are hotter than in the past; from more frequent and more intense hurricanes or freak years like the last one when there were none; from long periods of dry weather followed by unseasonable heavy rainfall and flooding; and from the recognisable erosion of coastal areas and reefs. Sceptics continue to deny that these phenomena are in any way related to climate change. But, increasingly, scientific evidence points to human-induced effects of climate change – something that the science-sceptics have not been able to disprove. Over the last two decades the Caribbean area has been the victim of climate change even though it contributes the least to the problem. Trinidad and Tobago is the region’s biggest polluter at a paltry 0.17 per cent of the world’s total CO2 emissions. Each of the other 13 independent CARICOM countries emits 0.01 per cent or less. The region has become the kitchen sink for the world’s polluting countries – developed nations principally the United States and Japan, and large developing ones such as China and India. The European Union (EU) countries taken collectively are also major polluters. Recent studies give Caribbean countries, including the mainland states of Guyana and Belize, no reason for comfort. The Inter-American Development Bank fears that the tourism industry in the Caribbean – the mainstay of many of the islands - could lose upwards of US$900 million a year by 2050. It also says that flat islands like the Bahamas are particularly vulnerable, and it estimates that, by 2053, climate change will cumulatively have cost the Caribbean up to US$2 billion. Also, the annual income from fishing may be affected by as much as US$140 million from 2015. The Caribbean Community Climate Change Centre in Belize has also posted an authoritative report which shows that the Caribbean is particularly at risk for dramatic rises in temperature with damaging effects on sensitive ecosystems that cannot tolerate even small changes in climate if they occur at a rapid pace. The indications are that, if nothing is done to halt the current trend of global warming, Jamaica will be among the first places on Earth (2023) to see a significant increase in temperature from the historical average. It will be followed by Haiti (2025), Dominican Republic (2026), Bahamas (2029), Guyana (2029), and Belize (2034). While these countries are specifically mentioned, all Caribbean countries will be similarly affected to some degree with consequences for agriculture, water, tourism and production. The problem is real. It is also enormous. While it has been present for some time, its urgency for governments has been overtaken by immediate problems such as contracting economies, high debt, high deficits and high unemployment caused by a combination of factors including poor policy choices. But, the problem is fast becoming one that goes beyond survival to actual existence. 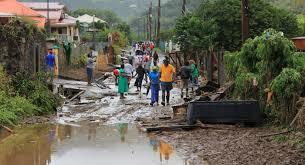 What happened in the twilight days of 2013 in Dominica, St Lucia and St Vincent and the Grenadines are wake-up calls that are echoes of flooding in Guyana and climate events in other parts of the region. Amid all this, the Inter-American Development Bank says the “region needs to dramatically increase its investment in climate change adaptation and mitigation in the coming decades”. But, where is the money to come from in a region that is highly indebted and whose governments are strapped for? So far, the international community has shown little willingness to provide the funding that Caribbean countries urgently need for adaptation to a problem of which they are not the perpetrators but the victims. Therefore, the idea of taking international legal action against the countries that are warming the planet has substantial merit. The idea was posited a few days ago (December 29) by Chris Huhne a former Environment Minister in the present coalition government in Britain. He pointed out that in 2013 “a group of small island states threatened by rising sea levels, led by Palau, came close to asking the International Court of Justice for an advisory opinion, and the main reason they did not press ahead then was that the scientific case is strengthening by the month”. He is supported in this view by Phillipe Sands QC, a professor of international law familiar with the Caribbean. At the urging of Dr Ralph Gonsalves, the governments of CARICOM have set up both a regional and national commissions to develop a legal case to seek reparations for slavery. Dr Gonsalves will shortly formally become the Chairman of CARICOM. Against the background of the clear evidence of the effect of climate change on the Caribbean, and his own country’s most recent experience, perhaps he might consider similarly placing on the agenda of Heads of Government possible international legal action to secure from the main polluters the financing they have been unwilling to provide despite the ruin inflicted on the Caribbean. The Caribbean can no longer merely endure the effects of global warming whose evidence is plain to see and whose offenders have been identified by no less an organization than the United Nations. The scientific documentation is already collected. What is needed now is a high quality team of negotiators backed up by scientists drawn not only from the Caribbean’s Universities and Climate Change Centre, but such sympathetic and experienced people in the global community who recognize the clear danger to survival of the Caribbean people.